Microsoft does not understand tablets, and this means the company cannot make a competitive mobile product. If you look at the hardware, it is easy to see why they have no chance. We have long been skeptical of Microsoft’s myopic and anti-user views of computing, and their latest debacle called Windows 8 is no exception. The only thing that lifts an x86 Windows 8 device off the bottom of the mobile device barrel is WART (Windows ARM RT). Microsoft’s tablets are simply not competitive against any of the competition because of the hardware BoM bloat caused by the excessive overhead of Windows. Microsoft pooh-poohs this, but they can’t escape hard facts. The short story is that Windows, WARTy or not, is a pig. It runs services that are backwards compatible to DOS based dishwasher control interfaces, and just layers more and more crap on every version while never daring to remove anything. This has tangible costs for the user, high purchase price, code quality, and utter insecurability are amongst the top few. Just looking at the hardware side, all that cruft takes up a lot of HD space and DRAM. Keeping that all ready for the user takes CPU cycles and therefore battery power. To keep up with the battery life claims, Microsoft has to use a bigger battery, bigger heatsink, more memory/flash chips, and more of nearly everything. This results in an expensive, heavy device, or a similar weight device made from extremely expensive materials. To make matters worse, it precludes Microsoft from competing on the lower end at all. This in turn ends up positioning their barely usable devices against the competition’s mid or high end parts. In short, even before the $90 or so that the WART OS costs OEMs, the competition has an OS cost of nearly zero, Microsoft can’t be in the same ballpark on price. This crippling problem is of course belittled by the Microsoft PR team, they just attack anyone who brings it up. That said, we eagerly await their latest astroturfing on our forums. Why? 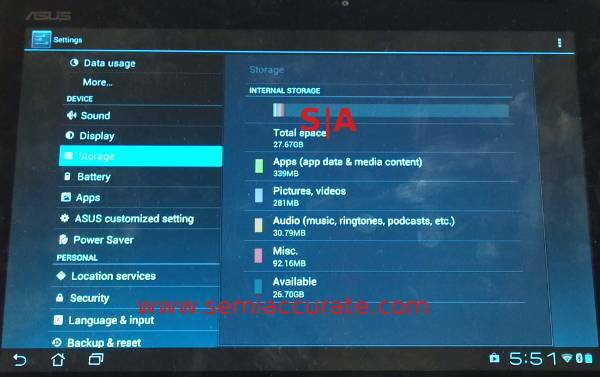 Take a look at the screenshots below, all taken from 32GB tablets. They are from a brand new WART Surface tablet with absolutely nothing installed other than the initial patches Microsoft forces on the user, clean reset. The next is from an iPad2 with iOS6, again clean after a full wipe and reset with no apps, pictures, or anything else loaded. The last is from an Asus Transformer Prime with Andriod 3.2 (Honeycomb) and patched to the latest everything seconds before the picture was taken. The Asus Transformer Prime does have some pictures and apps loaded on it, it was not ours to do a clean reset on. Assume a clean Transformer Prime would have more free space, but not substantially so. Android with a few apps. The result? Out of the box, the iPad 2 with iOS6 has 28.1 of 32GB free (87.8%), Asus Transformer Prime with Android 3.2 has 27.67 of 32GB free (86.5%) and the Surface has 15.0 of 32GB free (46.9%). Before you point out that WART ships with Office pre-installed and that takes up space, Pages + Keynote + Numbers on an iDevice takes up less than 1GB for a complete install, Quickoffice for Android is 12.x MB, OfficeSuitePro 6 is under 16MB. Both of these Android apps are downloaded size, not installed, but we seriously doubt either would bloat more to 100MB installed much less hit 1GB. Feel free to add any number you want to the above space used to make up for this, but even 10GB of apps would not close the yawning gap. To top it off, the Surface needs twice the working RAM as the Transformer with a faster version of the same exact CPU, but is much slower at everything. iPads ship with either 512MB or 1GB of DRAM depending on the version. The Microsoft bloat takes it’s toll, and the end result is simply not a viable product. Microsoft can sling PR bull to the tame press until they run out of cash but hard figures don’t lie. Microsoft can not turn Windows in to a competitive phone or tablet OS, it will always be behind because of it’s design. It is a bloated pig and will always be, the competition isn’t, but still manages to be better suited to the task at hand. For the consumer, that means Microsoft has a significantly more expensive product with a demonstrably worse experience. This is a fundamental problem resulting from bad management decisions.